When guest posting first arrived on the digital marketing scene, nobody was really sure about how Google’s regular algorithm updates would impact website ranking. Guest posting became the wild west of online marketing, with even big-name brands turning to questionable techniques to help their company website rank further up the search results. Today, trying to guest post the way it once was will never get you anywhere near good results. 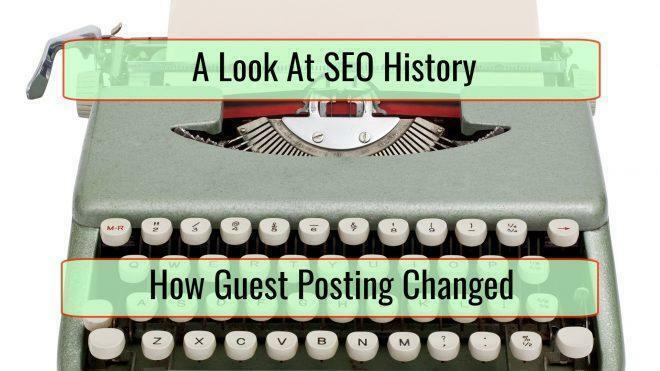 Guest posting has changed significantly in recent years, and with Google still constantly reviewing and adapting the way their algorithms rank sites in line with user demand, it’s expected to change even further still. 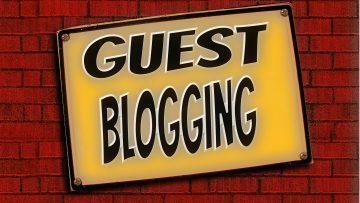 Read on to learn more about some of the main ways guest posting has evolved over the years. There was once a time where the actual quality of your writing wasn’t really that important when writing a guest post. As long as your post had the right keywords and links, you could pay no attention to your spelling or grammar and you’d still help the company market. This led to blogs accepting any and all content, regardless of whether or not it was actually good to read or, in some cases, even made any sense at all. Eventually, Google quickly put a stop to the effectiveness of these types of posts, and today, your guest posts need to be aimed at real readers, rather than simply for the purpose of getting another backlink to your site. It’s not just the content of a website alone that can impact the ranking. Engagement both on the website and with the content on social media also plays a part when it comes to where your website appears in Google search results. For this reason, promoting guest posts and encouraging engagement has become more important than ever. Just a few years back, all you’d need to do is write and post your guest post, and then you could simply leave it there and never think about it again. But times have changed. For a guest post to be truly effective today, it’s crucial to promote it on social media, as you want it to have as large a reach as possible. Back when guest posting had just become a thing, blackhat techniques were fairly normal and used to work pretty easily. However, search engines soon began to penalize companies and websites using these types of techniques. For example, hiding code in infographics, paying for a post to be published without making this information available to readers, or publishing guest posts on completely irrelevant sites are just some examples of prevalent blackhat techniques which were commonplace a few years ago but would be much more difficult to be successful using today. Today, Google’s main issue is providing an internet experience that is user-friendly. Because of this, there has been more importance placed on having a responsive website, providing links to social media, and focusing on an easy to use navigation system for your website – all of which can help your site rank better. 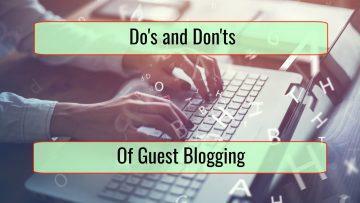 However, many businesses learned the hard way that Google also applies these rules to guest posting today. Unlike the old days where you could literally post anything with your link and watch your website shoot up the rankings, today, you’ll need to put more thought and effort into creating reader-friendly guests posts that provide serious value. It’s no longer about the link – if anything, linking to your site should be nothing more than an afterthought. Many modern guest posts no longer include the link in the body of the post but rather in the author bio instead. It’s all about putting together a post that invokes curiosity and answers questions for your readers. When guest posting first came about, it was long before the boom of smartphones. Most people back then would read blog posts on their desktops and laptops, so the very layout of a guest post was designed with that in mind. However, today’s internet users don’t really have the time for sitting down at their desk in front of a PC to read a lengthy guest post. Instead, they want to be able to get their content on the go using their smartphone or tablet. So, guest posters today should keep this in mind. Break your content up into smaller, manageable chunks that are easy to read on a smartphone and make it easy for your readers to come back and pick up where they left off if they are interrupted. Don’t just overload them with text, either – use visuals such as images, infographics, and videos to add interest to your blog posts and provide readers with a range of choices for getting the content. In the early days, bloggers would see guest post pitches as a way to fill their website with more content when they didn’t feel like writing themselves. However, over the years, bloggers have become more aware of the kind of content that could cause damage to their site; links to gambling and pharmacy sites, in particular, could harm a blog’s rankings, as could irrelevant links or links with no real value. And, content that provides no real value or information to the readers, or is badly written and makes little sense, can have a seriously negative impact on a site. For this reason, bloggers have become much more discerning when it comes to the type of guest content that they accept and many will have strict guidelines to adhere to before they will even consider publishing. Last but not least, compared to the early days of guest posting, tracking the type of content that is most successful is much easier, thanks to a wide range of advanced and modern tracking tools and software programs. Unlike years ago, there’s no need to guess at what will work or learn through trial and error. Need help with guest posting for SEO? Get in touch with us today!